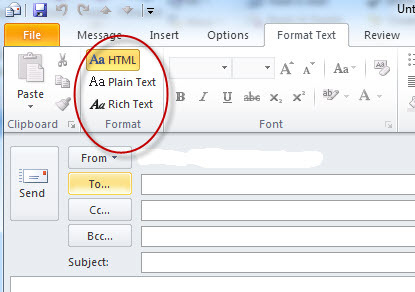 Outlook can send email in three different formats: HTML, Rich Text, and Plain Text. Rich Text format is problematic though as it automatically wraps all formatting into an attachment called Winmail.dat. It also tends to pack actual file attachments into the winmail.dat file which in some email systems will make the real attachments unreadable. Rich Text Format works fine when sending within the same organization, but when sending to external organizations, the winmail.dat issue appears. In addition, most anti-virus and SPAM filters are configured to block the .dat extension since it is one of the extensions widely used by viral and other malicious messages. 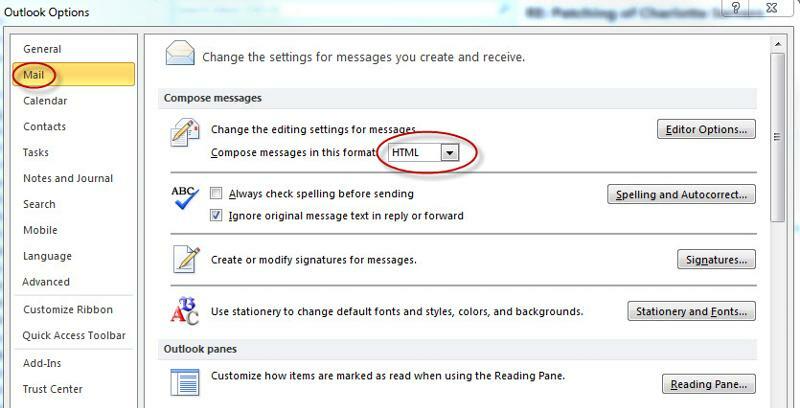 So to remove this issue (one less thing to impede your email message flow) you will need to do the following in Outlook 2010. This has to be done from the sender’s Outlook. I am glad you asked. There are two ways to set which format you want your messages to use when sending email. First is to set the defaults under Options, the other is to set it on each individual message as you compose the message. Let's start with option 1. Set the “Compose messages in the format” to either HTML or Plain Text. Scroll down to Message format and make sure it is set to either Convert to HTML format or Convert to Plain Text format. By turning off Rich Text Format, you remove one more obstacle to successful delivery of your important email messages.